After this invaluable time that I have spent with omnis, I now would like to move on towards slightly more directional designs in order to learn about audible differences first hand. However, a simple 8" with tweeter in a waveguide is not what I am looking for since such a combination creates too high a directionality at this stage. I bet you think that this looks like an ordinary monkey coffin speaker, do you ? 1. Controlled and uniform horizontal radiation that is in agreement with psychoacoustics. 2. Controlled and relatively narrow vertical radiation to minimize floor and ceiling bounces in form of a real D’Appolito arrangement. It is my opinion that more vertical control is not required. 3. Minimization of diffraction. 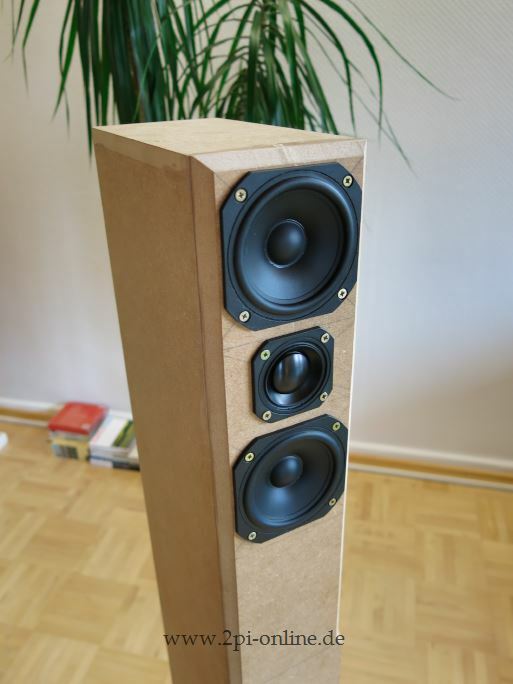 The midrange drivers are operated below the baffle step and the tweeter most likely beams enough before it negatively interferes with the edges. If not, chamfers will help. One baffle step (in the tweeter section this time) can never be avoided and has to be dealt with appropriately. 4. Placement of the woofer a la Allison (close to the floor) to avoid sound power response irregularities due to boundary effects between approx. 100Hz and 200Hz. 5. Separation of low end and mid/high frequency section at the typical Schroeder frequency of small rooms in order to address both operation modes of the room separately and systematically. For the FR above the transition zone see 1. and 2. With separate subs it is easier to implement more than one control mechanism in the modal region of the room as required (e.g. 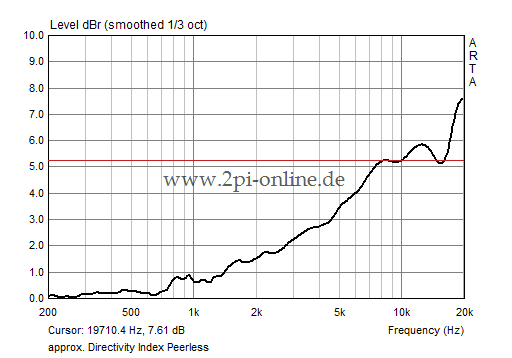 placement, low Q of the woofer HP behavior, DSP). 6. Max SPL has to be high enough for typical living rooms. 7. The speaker should be easy to build while being robust and somewhat nice looking (regular people don't understand plumbing pipes). A housing without audible resonances and vibrations of any kind and minimizing re-radiation of sound through the driver's cones goes without saying. That is rather a prerequisite than a design goal as well as low distortion. More pictures, also of the internals are available here. To the left, the approximated (horizontal) Directivity Index (DI) is shown. It is the average of all measurements from 0°...90° in 5° steps subtracted from the on-axis response. I use this form of representation because here you can easily see re-radiation of sound from the mechanical structures (diffraction) as well as the horizontal directionality which is in the steepness of the curve. 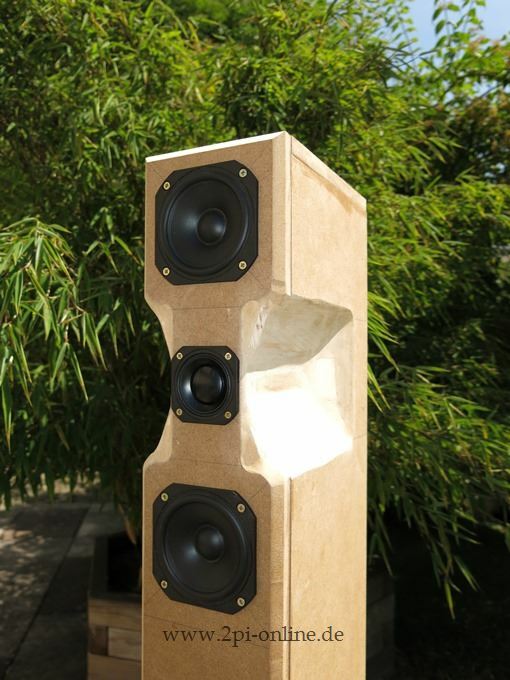 The graph was recorded with the Peerless 830970 in a minimum baffle and it was the technical basis of the idea for this speaker: Well controlled directivity with “medium” wide dispersion. The phrase "existence precedes essence" stems from the French existentialist philosopher Sartre. If taken literally in this trivial context of a hobby, it matches my philosophy of Purposeful Speaker Design in so far that the speaker's idea, the goal, all what makes it and thus its existence has to be there before it becomes essence in form of a plan or finally a physical building. However, I've chosen the lab name based on the Danish philosopher Kierkegaard, who is said to be the first existentialist. Also, the essence in form of the initial drivers is somewhat Danish again because of their long proven philosophy and quality. The used drivers (weak motor of the midrange and differences in sensitivity compared to the tweeter) and the listed features demand a fully active design again. The little box behind the mid/high section is an optional extension to host the required electronics. This version was planned from the very beginning in case the first versions with or without chamfers would not work. Version 0.1 and 0.2 were preferred initially because they were easier to build and I wanted to use the wider baffle as a rudimentary wave guide to increase the estimated DI (shown above) a little earlier. 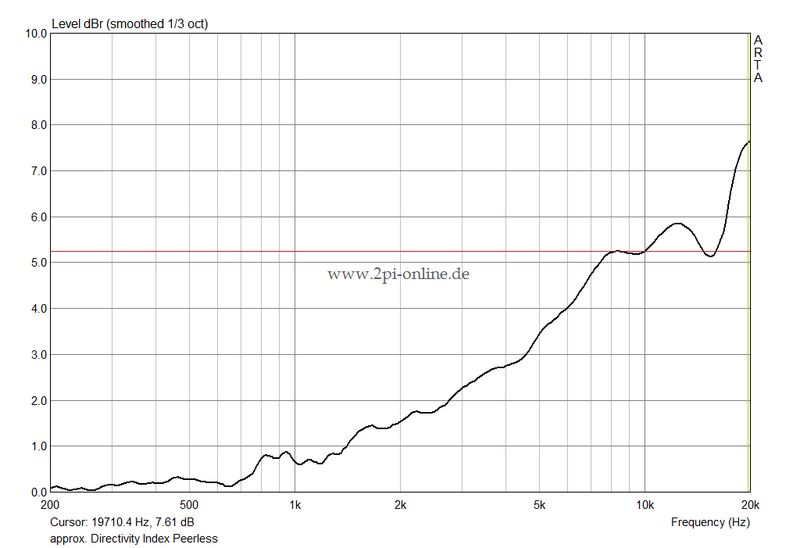 In Version 0.31 the spacing between the two mid-woofers has been increased in favor of the tweeter response. But the distance is still within the D’Appolito criterion.